The metal badge clip is one of our badge clips, in addition to the smooth surface of clips, it is also equipped with corresponding PVC straps, so you only need to buy a badge holders and then you can use it. It is very convenient. The metal badge clip is anti-rust and anti-corrosion, you can rest assured to wash it with water, and it has good elasticity. 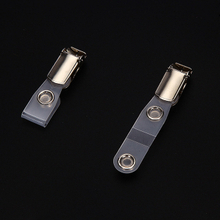 The specification of metal badge clips is a standard, can be completely matched with the corresponding accessories or ID cards. We will also give you some recommendations on the choice, so that you can get the best service of metal badge clips. If you have any questions or demands for our metal badge clip, you can contact us at any time. We look forward to receiving your information.